Joy Creek Photo Archive (c) all rights reserved (Polyanthus Group) We raised Primula 'Cowichan Yellow' from seed and admired its intense yellow blooms so much we put it in our gardens where visitors have seen it and asked for it. 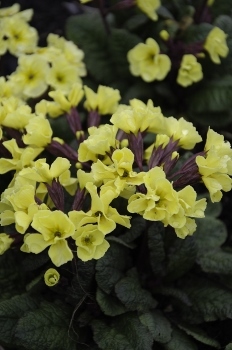 A robust plant with semi-evergreen foliage and umbels of vivid all yellow flowers. Spring to early summer. 10 in. x 12 in.